Public Service Minister Hon. Elias Kapavore launches the inaugural Pacific Institute of Leadership and Governance short course in Madang. Supporting the development of public servants in districts and provinces including opportunities to engage in the public-private partnership arrangement, were the key discussions of the Executive Advisory Board of the Pacific Leadership and Governance Precinct in Madang last month. The meeting also coincided with the launch of the new short course on project management. Public Service Minister Hon. Elias Kapavore said the Precinct is helping to strengthen the foundations of the public service. “We want to see an improved public sector in the country – today and in the future,” he said. Australian High Commissioner Bruce Davis said the development of public sector leaders is a priority of the partnership between Papua New Guinea and Australia. “The Board meeting and Project Management course held in Madang are important signals of intent for the Precinct to be increasingly focused on subnational areas,” he said. “It reflects Papua New Guinea and Australia’s shared commitment to ethical leadership, strong governance and inclusion in the public sector. The Precinct’s eminent Executive Adivsory Board includes John Kali, Jean Kekedo and Dame Meg Taylor. The Precinct’s eminent Executive Advisory Board comprises Archbishop Douglas Young, John Kali, Father Jan Czuba, Bruce Davis, Dame Meg Taylor, Tony Shepherd, Jean Kekedo, David Guinn and Serena Sasingian. 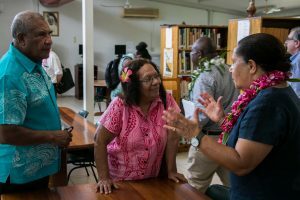 Board members toured the area around Madang town before the meeting, visiting Bilbil Village, RD Tuna and the Pacific Institute of Leadership and Governance regional training centre at the Divine Word University. 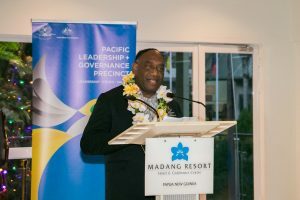 The Pacific Leadership and Governance Precinct is a partnership between the Governments of Papua New Guinea and Australia to support the development of ethical, capable public sector leaders throughout PNG.